My name is Kimberlee Knight. I have blond hair and freckles. Until last September my life was kept full with horse shows. I have been showing horses since I was nine years old. I compete in Western and English classes. now that I am twelve years old I keep setting new goals for myself. I plan to continue showing horses but now I am adding vaulting. 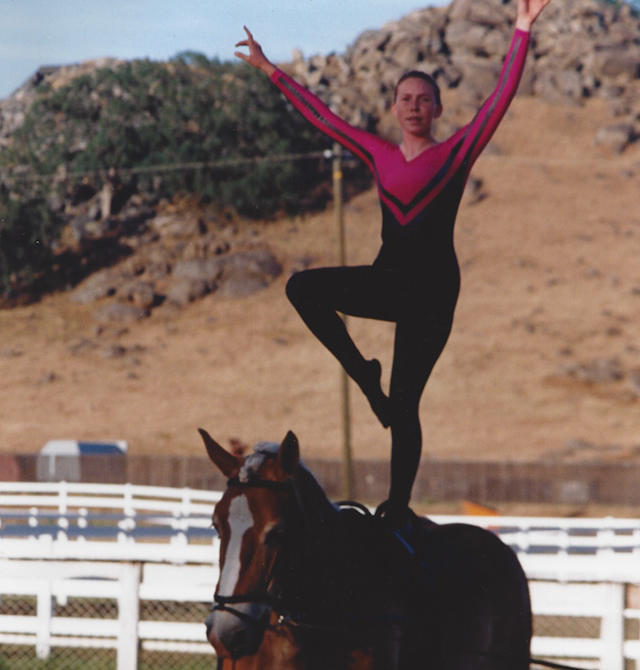 Vaulting makes me a better compeitior at regular horse shows because it improves my balance. When I was very small I took gymnastics for a while but horses won out. now I have found another sport that combines both of them. One day while I was competing at a horse show Alethea, out team coach, saw me and asked my parents if I might be interested in vaulting. My parents said that I could try if I wanted to. I did and now I schedule vaulting along with cheer, choir, showing horses and going to school. Last November I went to my first vaulting competition held in Moorepark; California. It was a great experience. I learned what it was like to go as a team. I made many new friends on that trip. I was fortunate in that I did very well and won two firsts on the horse and two seconds on the barrel. This gave me the champion ward* for the walk division. now I am ready to move on to the trot division and more challenge. I think showing horses helped me with vaulting because I know that your don't win all the time. I have learned to judge my own performance and feel good about it.